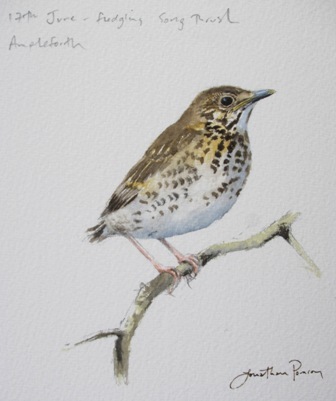 An exhibition of birds in landscapes opens at this fine Norfolk Gallery. I have about twenty paintings included, some of them of Norfolk but also scenes from Scotland and Northumberland. 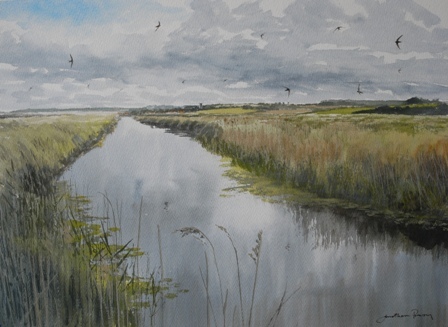 This watercolour shows Swifts over Arnold’s Marsh, Cley on a visit to the reserve back in May this year. Many Swifts were passing through during the morning. For more information please phone 01263 741742. My annual summer exhibition is now ready to be set up on 22nd July in time for the opening on 23rd July. If you are in the Bradford on Avon area do call in. I will have sketchbooks on display as well as approximately 40 original paintings a selection of which is shown on the tab above- West Barn exhibition 2011. This is an annual opportunity for me to man own exhibition and always a pleasure just to chat with people about birds and landscapes in the British Isles. The exhibition is open daily from 10am- 5pm. The West Barn itself is a barn rebuilt on original foundations. Original timbers date from between 1290/ 1325 and it sits next to the spectacular Tithe Barn. You can find a map to the West Barn here.